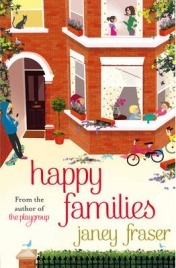 Janey Fraser has just published her third book, Happy Families. This follows on from The Playgroup and The Au Pair – all sent in the fictional suburban town of Corrywood. It is a very enjoyable read about three different people who find themselves in need of some parenting advice. Bobbie’s two young children never seem to listen to her and appear to be spiralling out of control. It doesn’t help that her husband is always working which means that he is never around to back up her parenting decisions. Andy used to be a workaholic until one day he decided he had had enough and sold his company. His idea was to spend more time with his wife Pamela and their two teenage daughters. However, things don’t turn out quite as planned because Pamela disappears to look after her mother leaving Andy to discover that his daughters are perhaps not quite as perfect as he had been led to believe! He is also left in the lurch when he has to step in and run the parenting course that Pamela was meant to be organising. Vanessa did not do very well bringing up her own daughter Bridget from whom she has been estranged for several years. When she unexpectedly finds herself having to look after her granddaughter, Sunshine, she is determined to do a better job even if it means having to give up the very recent love that she has found. Perhaps parenting classes will make her a better parent this time round! Happy Families is a thoroughly entertaining read and I really enjoyed getting to know the three main characters and their families. As a mum myself, it was also quite easy to identify with some of the difficulties they faced with their children as well as the absolute love that also comes with the role of the parent. Their stories were moving yet funny and the whole book feels like a tribute to all the mums and dads that always strive to do their best for their children but recognise that they are never perfect. Janey Fraser has created an absorbing tale that interweaves the three different characters and their families and I liked the way that the different strands came together at times. It’s also enjoyable the way that she has created a whole community of characters that appear in all of the books that she has written. Having said that though, Happy Families is a standalone read and you do not need to have read Fraser’s other books to know who everyone is. Overall, Happy Families is a light and enjoyable read that I did not want to put down. I’ll definitely be looking forward to the next book that Janey Fraser writes too. With thanks to publishers for the review copy sent. No Comments on "Happy Families"